Twenty years after a cutting-edge particle physics experiment at SLAC adopted a royal elephant from a series of children’s books as its mascot, BaBar (the experiment, not the elephant) is still looking ahead to future discoveries. In the two decades since its formal inception, the particle physics experiment known as BaBar has gone far beyond its original scientific goal: studying charge-parity violation, which is one method the universe uses to play favorites by showing a preference for matter over antimatter. But the agenda of BaBar’s 20th anniversary collaboration meeting in Frascati, Italy, last December did not consist of three days of researchers patting themselves on the back. They were too busy preparing further data analyses and future proposals. BaBar Spokesman Michael Roney, a particle physics professor from the University of Victoria, says that the hundreds of scientists who have belonged to the international collaboration have published more than 500 scientific papers in the past two decades, discussing everything from newly discovered types of mesons (a particle made of a quark and an antiquark) to coming to grips with Big Data before it even had a name. The one thing they haven’t done is combine their data with data from their competition, Belle, a Japanese experiment that ran at the same time and also provided valuable data about charge-parity violation. To solve that problem, Markus Röhrken, a post-graduate researcher at the California Institute of Technology and a relatively new BaBarian, will bring the Belle and BaBar datasets together for the first time. He’s on a hunt for aspects of charge-parity violation that could yield totally new physics beyond the Standard Model. Combining the data is more complicated than it sounds. “The physics behind BaBar and Belle is exactly the same,” Röhrken says, “but the detectors, the software, the experiments themselves are very different.” Röhrken must become expert in both experiments; while he was a graduate student at Karlsruhe Institute of Technology in Germany, his PhD work was done on Belle, so he’s already halfway there. But Röhrken has his own motivations for pursuing this. Japan is planning a follow-up to Belle, Belle 2, but it isn’t scheduled to start taking data until 2016 at the earliest. 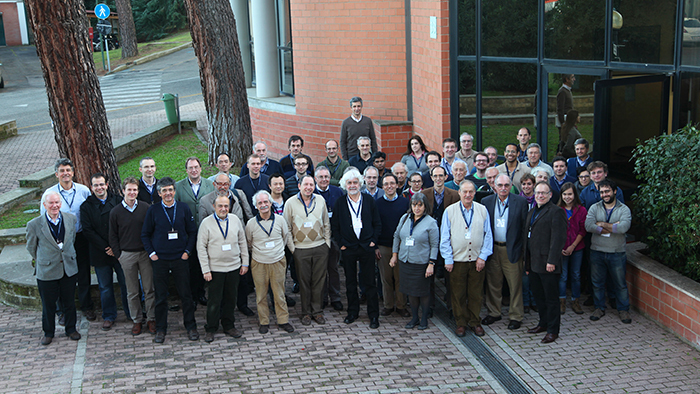 Attendees of the 20th anniversary BaBar collaboration meeting in Frascati, Italy. Top image caption: On December 2, 1997, a US Air Force cargo plane brought the 15-ton BaBar coil on the final leg of its journey to SLAC. The coil had about a 2-inch clearance in the huge transport plane. On the hunt for physics beyond the Standard Model, scientists recently searched BaBar data for evidence of invisible particles. To a single, isolated particle, time’s arrow could work just as well pointing forward as backward. But it doesn’t, says the BaBar collaboration. Light dark photons? Dark Higgs bosons? Scientists look for signs of these weird-sounding particles in data from BaBar—an experiment designed to explain a completely different mystery. BaBar completed its experimental run in 2008, but its parts will live on.